At our February meeting we will exchange Valentines. 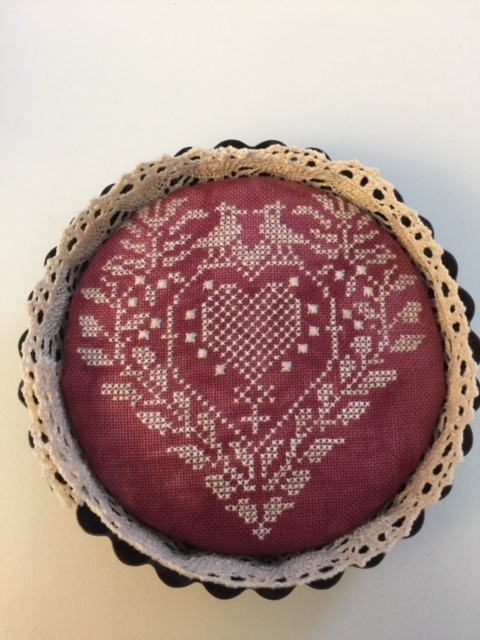 If you signed up at the January meeting, you will receive your Valentine pincushion kit created by Lynn McVey. Click on the picture for a larger image. Valentine exchange! Please bring valentines for all. It was great fun last year! We normally have about 15 people at a meeting. This kit is truly lovely! Lynn McVey has modified a beautiful heart pattern from a free 2010 Needleprint design and made up kits for the Guild. The fabric is 32 count Picture This Plus Tango linen and the silk fiber included is Silken Colors Antique Lace. The kit will also include cotton Cluny lace and a 4” tin. Cost is $15. Lynn has only 15 kits available, so be sure to sign up in January. Kits will not be mailed out. Lynn’s Valentine Kits sold out at the January Meeting. Copies of the Chart and Instructions will be available at the February meeting for anyone unable to get a kit. The silk provided is Silk N Colors – Old Lace. It used to be called Antique Lace. Show & Tell – Hearts!